Political activist Evan Mawarire (file photo). 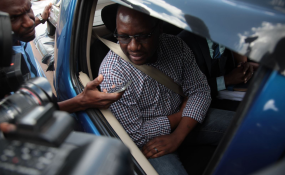 Security forces in Zimbabwe arrested pastor and political activist Evan Mawarire at his home in the capital Harare Wednesday, as the nationwide anti-government strike entered its third and final day. Beatrice Mtetwa, Mawarire's lawyer, told reporters that police "are alleging that he incited violence through Twitter and other forms of social media." Mawarire posted a series of videos on social media protesting the longtime rule of then-President Robert Mugabe in 2016 that launched the country's ThisFlag anti-government protest movement. Mugabe was pushed out of office by the military the next year at the age of 93 after ruling the southern African country for 37 years. Mawarire was acquitted that same year of charges of subversion against Mugabe's government. Most businesses in Harare were closed Jan. 14, 2019, as anti-government protests in Zimbabwe continued. Everyday life in Harare remains at a standstill two days after protests over a massive hike in fuel prices turned deadly. Businesses, banks and schools have been closed since Monday in response to a three-day strike by the Zimbabwe Congress of Trade Unions. Residents have been unable to access social media since Tuesday. Econet, Zimbabwe's largest telecommunications company, sent out a text message to its customers Wednesday that it was forced by the government to shut down its internet services. Several people were killed Monday when police in Harare and Bulawayo, Zimbabwe's second-largest city, fired live ammunition at protesters, who threw rocks, burned tires and blocked streets. Authorities have not released an official death toll, but the Zimbabwe Association of Doctors for Human Rights tells the Associated Press that five people were killed in the unrest. At least 200 people were arrested. Zimbabweans are angry over President Emmerson Mnangagwa's announcement last Saturday of a 150 percent rise in fuel prices. Mnangagwa defended the decision on Monday at the start of a five-nation overseas tour, saying it was necessary because local fuel was the cheapest in the region. Zimbabwe is suffering through a severe economic downturn marked by high inflation, a shortage of many basic goods and a shortage of foreign currency that many Zimbabweans use to conduct transactions. The country's own currency, known as bond notes, has been depreciating in value. Mnangagwa, Mugabe's former vice president, is trying to win back foreign investors sidelined under his predecessor. The protests are the biggest unrest in Zimbabwe since deadly post-election riots last August.